Nataliya Nataliya (or Natalia) Kuznetsova (nee Trukhina) (born July 1, 1991) is a Russian professional bodybuilder, world armlifting champion, and world bench press and deadlift champion. Her massive muscles put even the largest male bodybuilders to shame. Of course, like all powerlifters, Nataliya was not always so built. She once was a skinny, normal, everyday girl. At the young age of 14, she decided to join a gym in order to gain some more muscle. Before she knew it, she was hitting the gym everyday. She found a real passion in lifting and liked the quick results that she received. At the age of 16, only two years after she joined the gym, she was already titled champion at her region’s powerlifting competition. Now, Nataliya is the biggest she has ever been. Standing at 5 ft 5 in, the now 27-year-old has a bicep circumference of 18.5 in and leg circumference of 28.3 in. 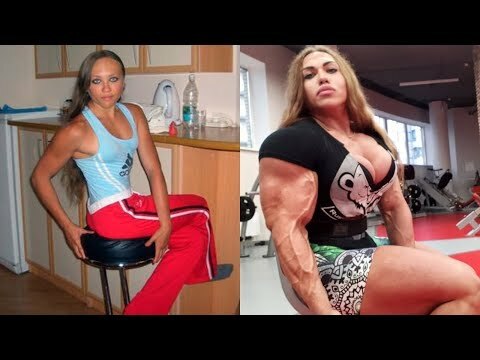 In 2014, Nataliya set world records when she deadlifted an impressive 529 lbs and bench pressed 374 lbs. She won her IFBB Pro Card at 2018 Romania Muscle Fest. Roider than Life. But honestly I'd probably do it too if I knew how and loved posing for myself in the mirror. Very beautiful girls, I love muscular women, they pose a challenge to society and all sterotypes about female beauty !!! please tell me the name of this girl?? Vou repeitar o gosto dela! Mais sem bomba nunca que uma mulher fica assim malhando, mesmo se ela malhar 20 anos. It's sad when a woman permanently ruins her body by taking male hormones. So it started transitioning early….